The liberal internationalism of the West is facing resistance that could have consequences for the stability of the global system. Modernization theory has failed to provide an adequate framework for the economic and social transitions of emerging regions. If policymakers do not learn the nature of complexity, they will not locate the obstacles to state-building, peacemaking, and democracy in a world whose trade patterns and political alliances are shifting in unforeseen and potentially dangerous directions. 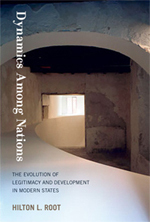 Dynamics Among Nations employs insights from the study of change in natural systems, and the study of state development , to offer novel problem-solving strategies for contemporary political economy. The book will be useful to policymakers, activists, scholars, students, and to general readers interested in current events as a source of new insights on the military, political, economic, and cultural interactions that will shape the emergent global order. The systemic impact of China on the liberal world order.